Lavendulan is an uncommon copper arsenate mineral, known for its characteristic intense electric blue color. 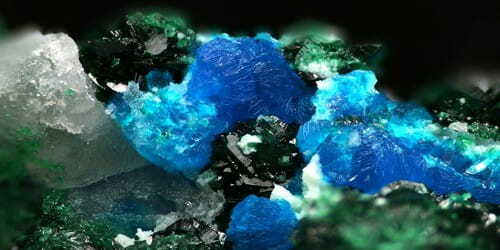 It is an orthorhombic mineral containing arsenic, calcium, chlorine, copper, hydrogen, oxygen, and sodium. Lavendulan is an uncommon mineral in oxidized copper deposits and can be found in Germany, England, the Czech Republic, Scotland, France, Spain, Tunisia, Iran, Namibia, Morocco, Chile, Australia, and the United States. Color: Blue or greenish blue. Lavendulan is a blue or greenish blue translucent mineral, with a vitreous to waxy luster, satiny in aggregates, and a light blue streak. Twinning is common. The mineral is brittle, with an uneven fracture. It is quite soft, with hardness 2.5, between gypsum and calcite, and relatively dense; its specific gravity is 3.84. It is easily soluble in hydrochloric acid. Lemanskiite and lavendulan are dimorphs; they have the same formula, but different structures. Lemanskiite is tetragonal, but lavendulan is monoclinic. Lavendulan has the same structure as sampleite, and the two minerals form a series. It is the calcium analog of zdenĕkite, and the arsenate analog of sampleite. It often contains potassium, cobalt, and nickel as impurities. At the type locality, lavendulan occurs associated with erythrite and a cobalt molybdate originally called pateraite, but now discredited. At San Juan, Chile, it is associated with erythrite, cuprite, malachite and cobaltian wad. 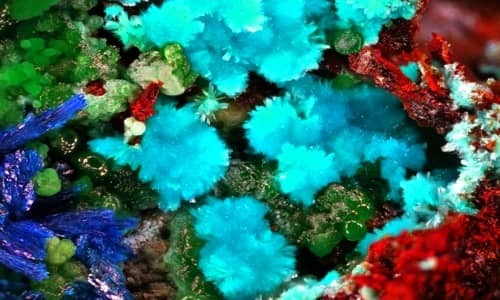 At the Cap Garonne Mine, Pradet, Var, Provence-Alpes-Côte d’Azur, France, associated minerals are chalcophyllite, cyanotrichite, parnauite, mansfieldite, olivenite, tennantite, covellite, chalcanthite, antlerite, brochantite, and geminite. It also occurs at Tsumeb, Namibia, associated with cuprian adamite, conichalcite, o’danielite, tsumcorite, fahleite, quartz, calcite, and gypsum.